It's not very often, when I walk into a gallery, that I feel a strong sense of calm curiosity. 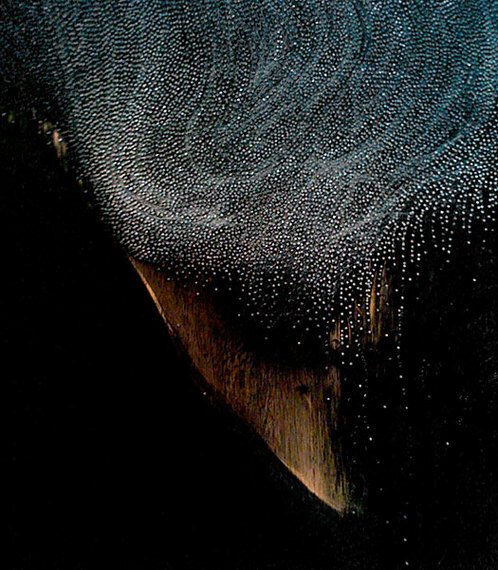 The work of Hyun Ju Park, which is currently on display at Causey Contemporary, has that affect. Working with Sumi ink, synthetic hair, nails and wood gouging tools Park creates a multitude of visual stimuli that evokes such things as a silken or satin surface in works like Untitled no. 9 (2008), to golden locks in Untitled 21 (2009), to a dazzling blaze in Untitled (Flames) (2008). The real skill here comes with Park's great understanding of what the natural lines of the wood's grainy surface implies with respect to movement, form and gesture. 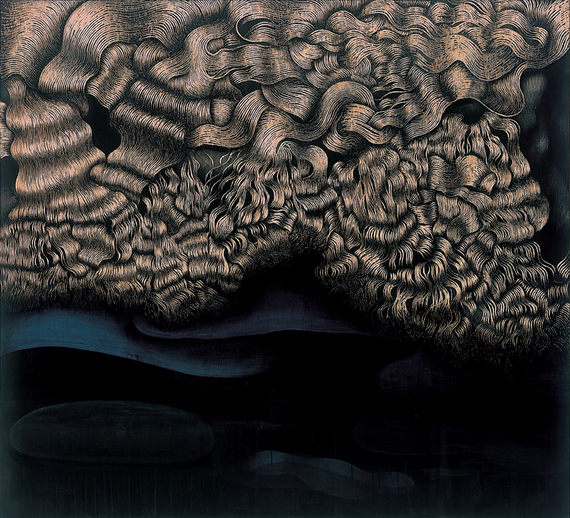 In utilizing this 'ingrained' element to a high level of potency, Park adds dimension and depth, while, with works like Untitled - Eddy (2007), the artist's black-out ink application adds a sort of cool chasm that suspends and activates the swirling frenzy of glistening nail heads that float above the abyss. Conversely, I found a particular personal interest in Park's carving element in pieces such as Untitled no. 8 (2010) and the aforementioned Untitled no. 9, and most especially in Untitled 21 which immediately reminded me of the infamous Chicago Imagists, or more specifically The Hairy Who sans the overt sexuality and trail-blazing color. This is a very good thing as it shows a nice range of outcomes from meditative and buoyant imagery to brazen and bold technique that here, runs the gamut between insightful ink application and carefully placed and embedded nails to an almost meandering metal comb-like swirling, swarming 'clawed-away' bands of gold. In the lower level of the gallery you will find a group show titled On the Abstract Side that features the works of four of Causey Contemporary's artists. 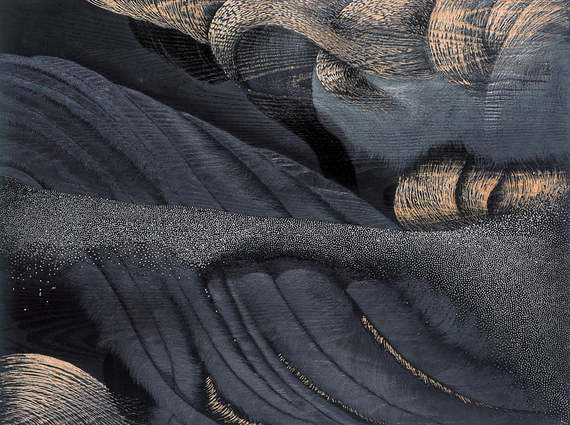 Alice Zinnes offers three watercolors on paper that express something celestial like the atmosphere of a gaseous planet or the formation of a distant star. 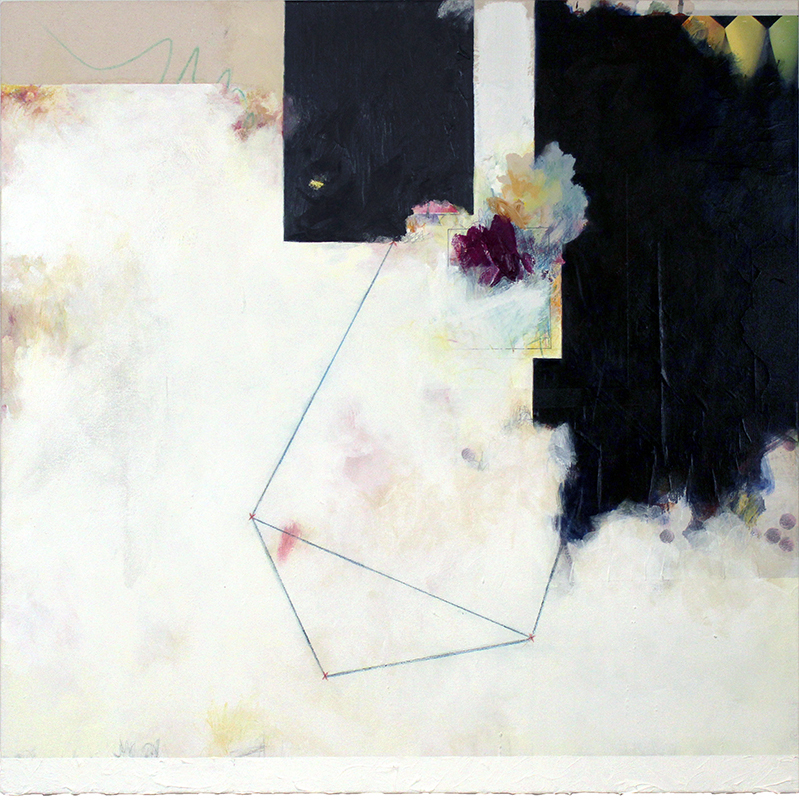 Edward Holland uses geometry, contrast, accents of color and collage to suggest both a progression and a panacea of two convergent spatial or compositional theories. Lisa Pressman's paintings remind me of what was being done and discovered in the heyday of 1950s more experimental or automatic forms of Modernism, yet her work somehow remains fresh and vibrant. Elise Freda, who I've mentioned in a previous interview with Moses Hoskins presents two decidedly vertical mixed media works that extol certain aspects of eastern sensibility and sensitivity toward nature and chance while at the same time commanding a great level of balance. In the end, both Pressman and Freda have an innate ability to control chaos while portraying space and structure without looking contrived or over thought. Lastly, we have the new comer Lisa Trivell's mixed media woodblock print that, like Freda, shows distinct connections to eastern culture and nature although here, the narrative is more complex and transient.